Now That Obasanjo Has Rejected His Christian Name, Matthew, What else Do We Call Him? 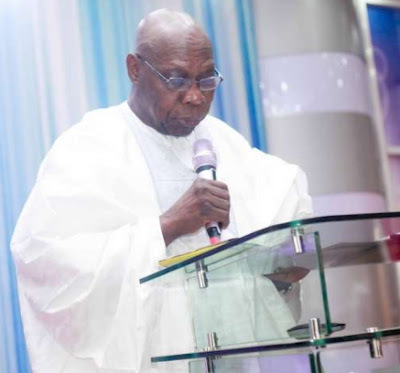 July 18, 2017 – Now That Obasanjo Has Rejected His Christian Name, Matthew, What else Do We Call Him? What irks Matthew Olusegun Aremu Okikiolakan Obasanjo, aka Ebora Owu, otherwise known as Baba Iyabo, against his Christian name of Matthew? The other day, the former military head of state and two-term elected president dared people to call him Matthew and risk seeing the red in his eye. That most sensational renunciation of a Christian name could well crawl into the Guinness Book of Records, as the most earth-shaking identity volcano of the year! What is more? The Ebora — okunrin meta! — is bracing himself for his crowning intellectual glory, a PhD in Christian Divinity from the National Open University (NOUN).What irks Matthew Olusegun Aremu Okikiolakan Obasanjo, aka Ebora Owu, otherwise known as Baba Iyabo, against his Christian name of Matthew? What is more? The Ebora — okunrin meta! — is bracing himself for his crowning intellectual glory, a PhD in Christian Divinity from the National Open University (NOUN). So, what sensational paradox would that be, a newly minted Christian scholar of the most rigorous crust, with more than a generous dose of native intelligence and street wisdom, throwing off his treasured Christian name. What’s happening? The end-time virus? In Obasanjo’s book, Matthew, the biblical tax collector turned Christian saint, was much a social fall guy as Judas Iscariot was a religious one. It was written: the Christ Jesus would die to save humanity. If he didn’t, humanity would perish from sin. But that “death” of the divine wouldn’t have been possible, without the divine decree that condemned Judas to betraying his master. As it so happened, humanity hailed the divine gift of Christ’s death — and eternal life. But condemned the “evil” fall guy who made that divine breakthrough possible! Tough luck. In the terrestrial plain, tax is the blood which pumps the life of the state. Without tax, what can anybody do? How would the body of engineers Baba Iyabo was addressing even land those big public sector projects, without taxation? Yet, here was Obasanjo pillorying Matthew, the tax collector, in the service of the Jewish state of his day, though under Roman imperialism. If there were no Matthews, how would that state have thrived and delivered development? Well, ill luck, as they say, is not transferable. So, is the fate of Matthew the tax collector, at least in the books of the Ebora Owu. Well, what do we now call him, in view of this repudiation, particularly as the general seemed to suggest that he had always rejected Matthew but just chose to dramatically make it public? And o, by the way, no one should dare the Ebora Owu’s red eye. In the awesome Ebora community, the Ebora Owu is in a formidable world of his own. So, what do we call him? Well, not Matthew. Maybe Aremu. And if that one has too much of a local feel — the other day, a former fellow soldier-turned-political-traducer dismissed him as Aremu of Ota — why not just simply Sege? I suggest “Aragbe”, which literal interpretation means life is delicate, tread with caution. Matthew and Ebora which means a person possessing occultic powers don’t go together, anyway. He didn’t land that name for nothing, so kudos to you, Sir, for renouncing Matthew. The Biblical Matthew was a God fearing disciple who did exploits and won souls for the kingdom of God. He is just realizing the stigma attached to slavery, that’s where and when the slave masters started controlling us, by letting us reject our original names to be answering English names in the name of Christianity. They still follow up by painting Satan black while Yeshua(JESUS not Original name)white….so much has gone wrong,until we start to know our root and be ourselves,nothing will work out. We all no baba is a joker.